Ultimate Guide to Hi-Fi 2009 on sale today! | What Hi-Fi? Ultimate Guide to Hi-Fi 2009 on sale today! It's packed with more than 300 reviews of all the latest hi-fi kit, including CD players, amplifiers, speakers, systems, music servers, accessories and all things iPod. And there's an incredible £7000 worth of hi-fi to be won in our exclusive Ultimate Guide competition. We've got three fantastic hi-fi systems to give away, from Yamaha (worth £2900), Roksan (£2300) and Myryad (£2000). Inside the issue you'll find a mouthwatering selection of products to help you build your dream hi-fi system. We've got CD players from £270 to £10,500, stereo amplifiers from £270 to £15,250, pre/power amp combos from £1800 to £18,500 and speakers to fit every budget, from £110 to £12,000. Thinking of bringing your old vinyl back to life? Then don't miss our reviews of top turntables, from a £140 Pro-ject to a £4500 Clearaudio deck. And if you'd prefer an all-in-one system to hi-fi separates, we've got plenty of those too, plus a whole range of iPod docks, network music players and accessories. 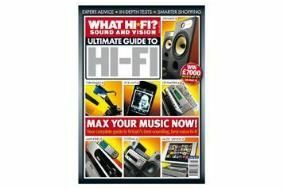 Copies of the Ultimate Guide to Hi-Fi 2009 are available for £4.99 from WH Smith, Sainsbury's, Borders and all good newsagents, or to subscribe to the Ultimate Guides click here.